When Hamilton Park, a multiple-dwelling condominium unit in Beverly Hills, CA, was in need of a new roof this past spring, several factors had to be taken into consideration. Andrew Hughes, owner/president of Ace Roofing Systems, of Wilmington, the contractor for the project, said the goal was to be as unobtrusive as possible when it came to the building's occupants. Because the Hamilton Park condos are in a densely populated area where parking is at a premium, Hughes said that Ace had to take care not to block driveways with tar kettles and machinery. That was the main reason self-adhering modified bitumen was the product of choice. The lack of kettles, pipes and odors also were contributing factors to choosing self-adhering mod bit. The complex was reroofed with Self-Adhering Mod Bit from Mule-Hide Products Co. Inc., of Beloit, WI. In addition to 120 squares of mod bit, the complete renovation entailed refinishing a pool deck and parking deck system, new gutters and vents, waterproofing, moving electrical equipment and replacing some of the wood decking on the roof. The multiple-owner challenge Working with a homeowners association is a challenge because you have to please a panel of concerned condo owners. Members of the Hamilton Park Homeowners Association were well informed of torch hazards and would have had to carry additional insurance if the roofer used torches. According to Ace Roofing Systems Project Manager Bob Cappy, torch-down systems are no longer a preferred choice. "I think because of the way that liability insurance is today, roofing companies are getting away from doing torch-down systems, because, as you know, with torch, you can lay something down and have a cinder or something smoldering that may produce a flame. So we're kind of getting away from using a torch for that reason." Cappy said self-adhering mod bit is a good alternative to torch-down systems and a comparable, if not better, product. "There's a lot less liability, so you're going to see this product a lot more. Most of the manufacturers are coming out with a self-adhering product because of this." Many insurance carriers will not even consider contractors that work with torch-applied systems, with residential roofers being most at risk of losing coverage. A clean and safe solution The Hamilton Park Homeowners Association liked the idea of no torches, pleasing aesthetics and a manufacturer's warranty. In fact, the association was so committed to a no-torch product, it searched for a roofing company to install that specific type. 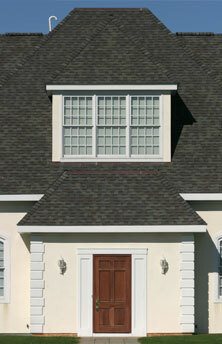 The company of choice, Ace Roofing Systems, employs approximately 50 and was started by Hughes in 1987. Among other high-profile projects, it was responsible for reroofing the Union Bank high-rise in downtown Los Angeles a few years ago, the first high-rise constructed in the downtown area. Cappy said it wasn't difficult to convince the association that self-adhering mod bit was the best choice for them, and they liked the new Chestnut Blend color. "Kevin Pirih from Mule-Hide and I talked to them about the advantage of doing this type of a system instead of hot asphalt or a torch system, and they basically agreed." The modified bitumen is SBS-based, Cappy said. "As far as my crew is concerned, it's a lot easier to work with than a torch."